MORGANTOWN, W.Va. (AP) — No. 13 West Virginia was determined to make up for being embarrassed in its last game on the road. Will Grier threw three touchdown passes and the Mountaineers used a big second quarter to cruise to a 58-14 victory over Baylor on Thursday night. 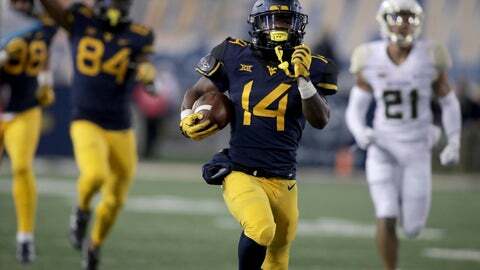 The Mountaineers (6-1, 4-1 Big 12) bounced back from a blowout loss at Iowa State with arguably its top performance of the season on offense and one of its best on defense. “We finally played a complete game for four quarters,” coach Dana Holgorsen said. During a 31-point second quarter, Grier had TD tosses of 25 and 65 yards to David Sills, and Grier ran for a 1-yard score for a 41-0 halftime lead. It marked the most points in a quarter for the Mountaineers since they scored 35 against Clemson in the Orange Bowl following the 2011 season. West Virginia had 10 first-half drives, compiled 435 yards by the break and 568 overall. Grier had his best game in the span of a month after getting sacked seven times against Iowa State, throwing three red-zone interceptions against Kansas and failing to get the Mountaineers into the end zone in the second half at Texas Tech. He was limited to 100 passing yards in the 30-14 loss to the Cyclones two weeks ago and had 302 by halftime Thursday. Grier finished 17 of 27 for 353 yards and sat out the fourth quarter. Baylor had come up just short at No. 6 Texas two weeks ago, driving to the Longhorns 17 in the final seconds but couldn’t reach the end zone and lost 23-17 . The Bears (4-4, 2-3) were never in this one. They were limited to 287 total yards. Charlie Brewer, who nearly brought Baylor back from a 38-13 fourth-quarter deficit against West Virginia as a freshman last year, threw three interceptions and was replaced by Jalan McClendon in the second quarter. Rhule said Brewer “looked a little out of it” as he left the field and was being evaluated for a potential injury that Rhule didn’t specify. Brewer went 1 of 8 for 22 yards. Evan Staley kicked three field goals for West Virginia. His 44-yarder in the third quarter boosted the lead to 44-0. Baylor: The Bears lost their third straight road game to a ranked league opponent. They still have plenty of chances to get two more wins to become bowl eligible a year after going 1-11 in Rhule’s first season. Baylor dropped to 0-4 against West Virginia in Morgantown. West Virginia: The defense had 12 tackles for losses, including five sacks, and was noticeably better after what defensive coordinator Tony Gibson pointed out were 31 missed tackles in the team’s only loss. Linebacker David Long said the defense was ready to redeem itself. West Virginia’s wide receivers combined for just eight catches two weeks ago in part because they couldn’t separate themselves from Iowa State defenders. They made a point to get open Thursday. Sills had five catches for 139 yards and Gary Jennings had three for 100 yards. Jennings caught a 53-yard TD pass from Grier on West Virginia’s first drive and a 36-yarder from Jack Allison in the fourth quarter. The Mountaineers could have an opportunity to move up in the AP Top 25 poll after falling out of the top 10 last week. Baylor: Hosts Oklahoma State on Nov. 3. West Virginia: Plays at No. 6 Texas on Nov. 3.